Ahmed Bola Tinubu is arguably the self-proclaimed leader of the Yoruba in Nigerian politics. It couldn’t be more obvious than during the 2015 presidential election when he got many Yoruba to vote for President Muhammadu Buhari. Buhari so literally worshipped him that had Tinubu sneezed, Buhari would have easily caught cold. But once Buhari became president, the humiliation and side-lining of Tinubu began. The House speaker position Tinubu reserved for one of his political godsons, Hon. Femi Gbajabiamila, was lost to Yakubu Dogara. The Senate president post he reserved for Ahmed Lawan went to Bukola Saraki. But there was nothing more humiliating than Buhari merging three powerful ministries — housing, works and power — and assigning them to Tunde Fashola, who in 2015 suddenly turned Tinubu’s worst enemy to the extent of both publicly throwing mud at each other. In fact, nothing was more humiliating to Tinubu than Buhari using Fashola to spite him. Another unbelievable humiliation that Tinubu had to stomach came as a result of the sudden death of Prince Abubakar Audu and INEC declaring the Kogi governorship election inconclusive. Instead of Hon. James Abiodun Faleke, Tinubu’s political godson, Yahaya Bello, who was only second in APC’s primaries, was picked to replace the late Audu. Tinubu made a lot of threats but seemed totally ignored by Buhari. The next was the Ondo APC governorship primaries where Tinubu’s candidate, Segun Abraham, lost to Rotimi Akeredolu who was Abuja’s preferred candidate. These coups were carefully planned and targeted at dismantling Tinubu’s southwest power bloc with the goal of positioning Tunde Fashola and Kayode Fayemi to replace him as the popular ‘southwest Buhari boys’. Also unable to control her anger, Tinubu’s wife Senator Remi Tinubu started protesting her husband’s endless humiliation by the same Buhari whom he had helped to become president. Both husband and wife’s protests were completely ignored by Buhari. Even as recently as the Ekiti governorship election, APC candidate Kayode Fayemi insultingly told Tinubu to mind his business and never interfere. So humiliated, Tinubu quietly stayed away and was only allowed to come to campaign for Fayemi on the latter’s terms. Tinubu was not involved in the deal that got Senator Iyiola Omisore of the SDP to back the APC governorship candidate for the Osun governorship election. The biggest kick in the teeth was when John Odigie-Oyegun, APC national chairman who was Tinubu’s ally, began to distance himself from him while openly realigning with Buhari. With Tinubu so encircled, he remained the national leader of APC only in name. But cry not for Tinubu for he brought the humiliations to himself. Being politically so greedy, Tinubu wanted all government positions determined by him alone. Besides the VP position he gave to Osinbajo and the FIRS chairmanship position to Babatunde Fowler, former Lagos State Board of Internal Revenue executive chairman, Tinubu also wanted to control the leadership of the National Assembly along with ministers from almost all the 36 states. Even the EFCC chairman, Ibrahim Magu, was handpicked by Tinubu, using the vice president. And with Saraki’s Senate refusing to confirm Magu, he has unbelievably remained acting chairman since then. But as the 2019 presidential election approached, Buhari once again needed Tinubu. He also knew how to catch Tinubu to submit to his political manoeuvring. 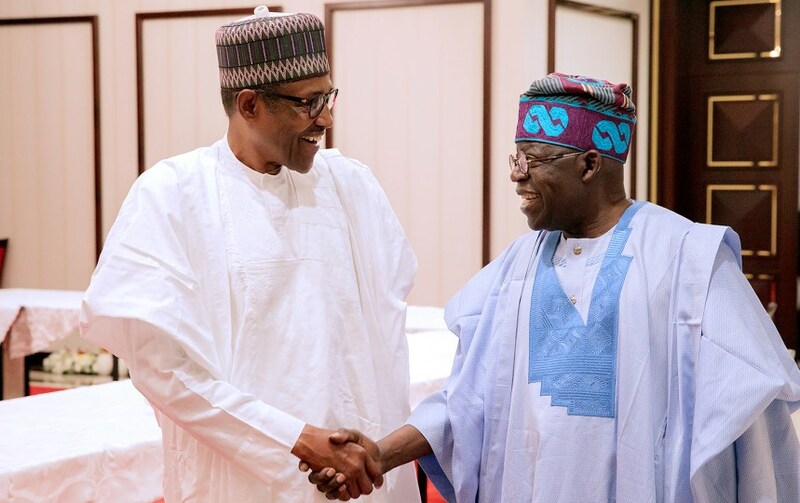 First, aware how Wale Tinubu’s Oando was in deep trouble for having inflated the values of Oando’s shares, Buhari reached out to Tinubu at a time his younger brother was being questioned by officials of the Securities and Exchange Commission. Second, Tinubu was invited to fly with Buhari to London. And during this long trip, as a military tactician, Buhari informed Tinubu of his readiness to hand over power to him come 2023. It’s on the basis of this false promise that Tinubu became so uncontrollable in Buhari’s re-election project to the extent of sacrificing the Afenifere and the overall Yoruba and national interests. In the meantime, Tunde Fashola was strategically asked to keep silent and possibly stay out of political circulation. This way, he would never make the mistake of bumping into Asiwaju Tinubu until the 2019 elections are over. When Tinubu demanded the removal of John Odigie-Oyegun as the APC national chairman and his replacement with Comrade Adams Oshiomhole, Tinubu’s political hangman, it was quickly granted. Another but failed request of Tinubu was the insistence on the humiliation and removal of Bukola Saraki as the Senate president. Now in full control of APC, Tinubu and Oshiomhole ensured that they took the battle to the enemy governors, including the chairman of APC Governors’ Forum, Imo State governor Rochas Okorocha; Ogun State governor Ibikunle Amosun; Zamfara State governor Abdulaziz Yari, Governor Akinwumi Ambode of Lagos, and many enemy senators. With this the duo had since set the APC on fire. Tinubu’s lack of political sophistication can’t be more obvious. This is because a seasoned politician would have known Buhari’s 2019 re-election game. Or does Tinubu need to be reminded the kind of disdain Buhari has for him, especially given how Tinubu turned Lagos State into a personal empire? Unbelievably, how could Tinubu in all his political calculations think that Buhari would ever allow a Tinubu, a Muslim southerner, to become his successor, and a northern Christian becoming his running mate? Unknown to Tinubu, Buhari’s preferred successor should be Gov. Kayode Fayemi of Ekiti State who could possibly be paired with either Mallam Muhammed Bello (minister of FCT) or Engr. Suleiman Adamu (water resources minister and Buhari’s nephew). As far as Buhari is concerned, how could Tinubu, whose Alpha Beta has been collecting tax revenue on behalf of Lagos government and retaining as high as 10%, expect Buhari to allow him to become Nigeria’s president and possibly bring in the same Alpha Beta to be collecting tax for the whole country and retaining 10%? Or the same Tinubu whose wife is a senator, whose daughter is the president-general of a market women’s union even when she is not a market woman, and whose son-in-law is a powerful member of the House of Representatives? If Tinubu were politically sophisticated, he would have known that Buhari’s political fate has since been decided by the country’s most powerful army generals — Olusegun Obasanjo, Ibrahim Babangida, Abdulsalami Abubakar, TY Danjuma, and Aliyu Gusau. Had Tinubu been sincere to himself, he would have known that it would be easier for a camel to pass through the eye of a needle than Buhari to win the 2019 presidential election, especially given how world powers such the US, the UK, EU, Canada, Saudi Arabia, Iran, etc., have all agreed that Buhari must go so that peace, unity and economic prosperity could return to Nigeria. If I were Tinubu, this would have been the most appropriate time to settle scores with Buhari. There wouldn’t have been a better time to revive the old friendship with Atiku, the next president. Even if Tinubu doesn’t feel like publicly supporting Atiku, it would have been politically wise for him to keep quiet rather than cry more than Buhari the bereaved, as he did recently. Who was Tinubu trying to impress with his recent vulgar language? Wasn’t it simply exposing his quick-to-anger personality, his self-centeredness and his self-praise? A man controlling his kind of regional political power bloc shouldn’t have been this undiplomatic in language. Or is Tinubu telling us that once one lived in a ghetto one could have left the ghetto without the ghetto leaving one? “Self-discipline,” Elbert Hubbard rightly said, “is the ability to do what you should do, when you should do it, whether you feel like it or not.” This important leadership personality trait seems to be completely lacking in Ahmed Tinubu. He was recently caught on camera bitter and shouting, as he told Governor Ambode, “You don’t dare talk when I am talking! Because I have spoiled you (by making you governor), you now talk when I am talking.” Did Tinubu fail to recognize that he should have respected, not necessarily Ambode as the chief executive and the number-one citizen of Lagos State but the office of the governor of Lagos which Ambode occupies and Tinubu once occupied himself? Another Tinubu’s recent outburst is where he publicly said, “We don’t fear, whether he (Atiku) is meeting in the jungle, in Dubai or in Abu Dhabi…but we are not going back to the illusion of the PDP…We can’t go back to the pit that we inherited for 16 years. They can strategize from anywhere, but a leopard cannot change its skin.” This only shows Tinubu’s tactlessness. It also portrays his political naiveté and his endlessly living in the fool’s world. Imagine believing that Buhari will hand over to him in 2023 should he ever win! I thought Tinubu, as Atiku’s old friend, would have imbibed some leadership qualities from him: his calmness, friendliness, generosity and tolerance; particularly his likeability among the Nigeria youths whom he is always interacting with on social media and at social events. Also, didn’t he learn Atiku’s humility and bridge-building ability among political allies and across ethnic and religious divide? Did he not grasp Atiku’s quality of being a trusted deal-maker with exceptional love for the poor, whom he helps through many foundations and social causes? You Tinubu are too imperial and withdrawn, always calculating what you can take out of the system. As a result, you are not seen to be a nationalist but a regional leader. Of course, it is not too late for you to abandon the APC ship, which Buhari is about to sink.